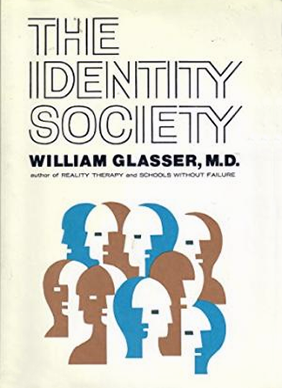 “Technology has progressed… because we are willing to or have embraced a new theory or a new way to use an old one.” “In almost all attempts to improve human progress, for example, to improve marriages, families, schools, or work, there has been no operational change in theory. 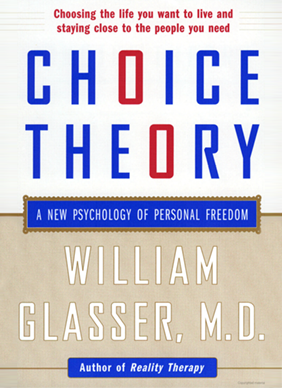 External control is so firmly in the saddle that even when we make a little progress, we are blind to the fact that we have given up external control psychology and are starting to use what is, in essence, choice theory. 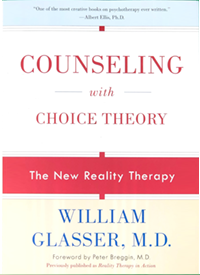 What I am addressing is our need to become aware that there is another psychology.” — William Glasser, M.D. “The positive addict enjoys his addiction but it does not dominate his life. From it he gains mental strength which he uses to help himself accomplish whatever he tries to do more successfully. 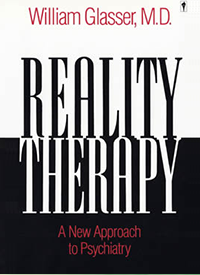 Unlike a negative addict, who is satisfied completely to live for his addiction, to the exclusion of everything else, a positive addict uses his extra strength to gain more love and more worth, more pleasure, more meaning, more zest from life in general. 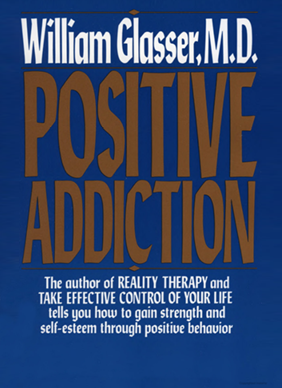 Positive addiction is especially valuable because it is a way in which anyone by himself can increase his strength. Every other way in which we gain strength depends on others, either for more love or more recognition, but no matter how lonely or how worthless you may be, if you can become positively addicted you can gain strength. 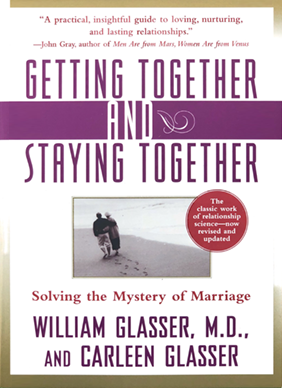 You can then use this strength to gain more love and more worth.” – William Glasser, M.D. 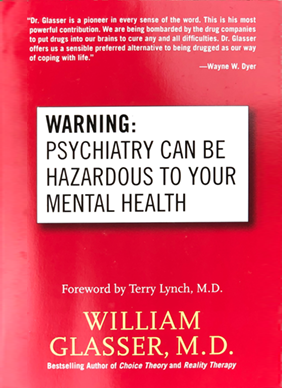 “The use of these [psychotropic] drugs for fibromyalgia is no more supported by research than the use of antibiotics is supported for a viral infection. Psychotropic drugs are strong and change the physiology of the brain in many ways that are not yet understood and may add to the problem.” ” While you wait for an effective medical treatment that doesn’t take into account the relationship problems I have been explaining, I ask you to weigh the further possibility that the pain and disability you are experiencing may be caused by something few people- doctors and patients alike- ever consider. 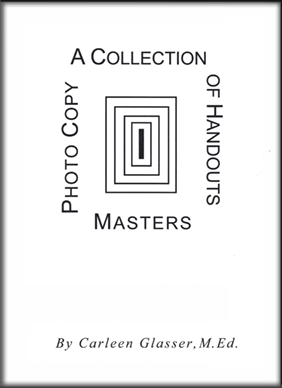 This element, creativity, is very much a part of every total behavior you choose. It can affect any or all of its components. 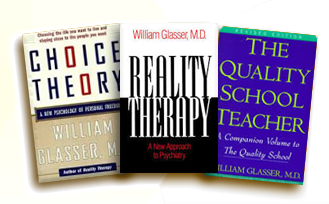 Could it be that the more creative you are, the more you are susceptible to “diseases” such as fibromyalgia?”– William Glasser, M.D. External Control “As soon as I come in the door, you start nagging. 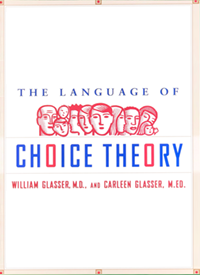 “Why weren’t you home earlier?” “The kids hardly see you.” “The toilet’s still running.” I tell you, I hate coming home anymore.” Choice Theory Alternative “I know you’re dissatisfied. I’m dissatisfied, too. You keep nagging, I keep withdrawing. Where are we going? Is this the marriage you want? Let’s get your mother to take care of the kids, so we can go away for a weekend and try to figure this thing out. I’ve given up caring who’s right and who’s wrong. I’d like some time to love you and to talk together. 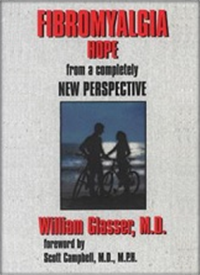 Anything would be better than this.”- William Glasser, M.D. 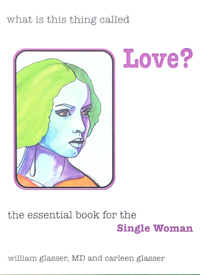 “We are involved with the wrong mate and he or she must change for us to be happy. But we remain the same, our mate doesn’t change, and our unhappiness continues. What we have to understand is that the only life we can control is our own and, in almost all instances, we can choose to change. “Depending on what changes we make in our lives, there is a strong possibility that our mate also may choose to change. And if he or she changes in the right direction, our marriages can become much better. Therefore, we can change only our own lives; we cannot change what others do. 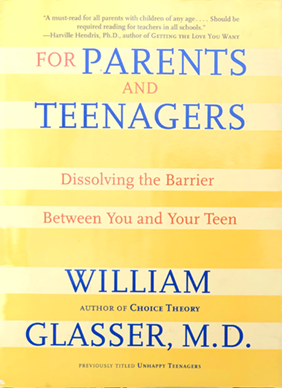 It is to this vital truth that this book is addressed.” – William Glasser, M.D. 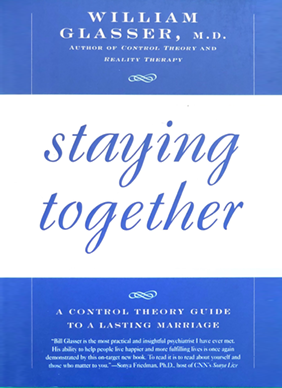 “If you read each lesson together willingly, talk it over, and try to put the information in the lessons to work in your marriage, you should be able to enhance your marital happiness. 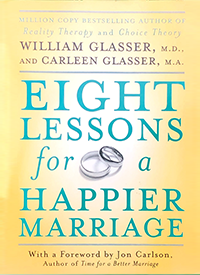 The eight lessons become a marriage enrichment experience. 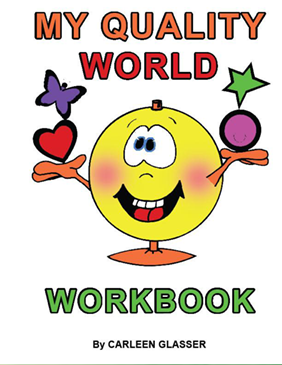 As you go through the book, each of you will learn how to behave differently with each other than you are behaving now, and this way will be different from how almost all married couples have behaved with each other for thousands of years. 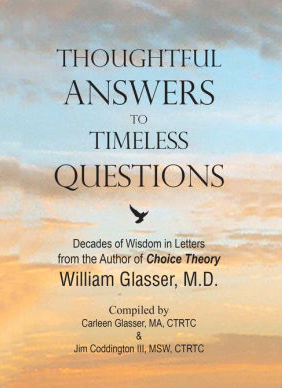 From our experience, while the lessons will be new to you, they are neither difficult to understand nor complicated to put into practice.”— William Glasser, M.D. 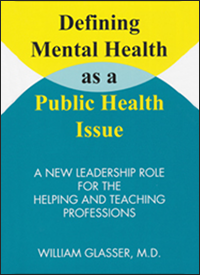 and Carleen Glasser, M.A. 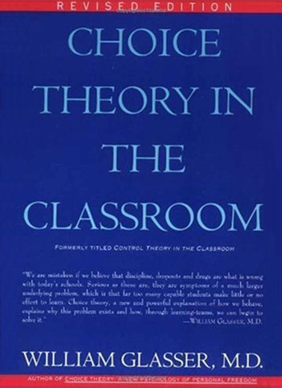 “In Chapter Ten of Choice Theory, I stressed the importance of redefining education. As long as we keep the present definition, education is acquiring knowledge- a definition obsolete since books became cheap and easily available- we will fail to improve school achievement. Using this definition, there has been no measurable improvement in the last fifty years no matter how we measure school success. 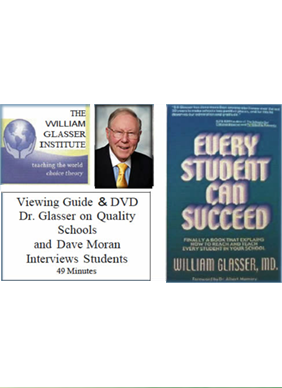 We need to move to a new definition, education is using and improving knowledge that is congruent with recent findings on how the brain works and with the information age we have now entered.” — William Glasser, M.D. 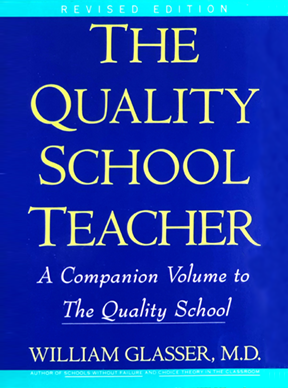 “Much has been written on the difficulties of improving education in the central city. 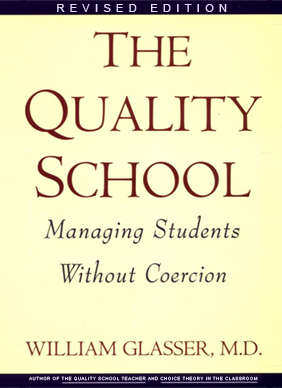 From personal experience, I believe that most people who write about these schools have not raised the critical issue. They have been so obsessed with the social, environmental, and cultural factors affecting students that they have not looked deeply enough into the role of education itself has played in causing students to fail, not only in the central city but in all schools. It is the faults and shortcomings of the system itself that I wish to examine, and make suggestions to correct. 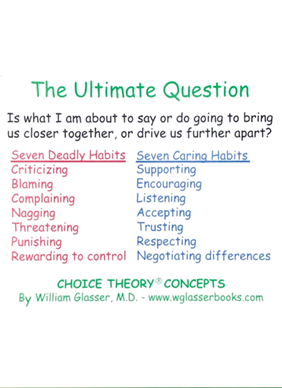 — William Glasser, M.D. 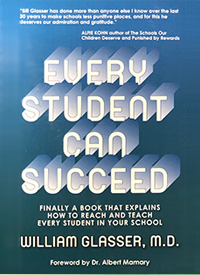 “Boss-teachers and administrators constantly lament that students are not motivated, but what they are actually saying is that they do not know how to persuade students to work. And as long as they continue to believe in coercion, they never will. When it comes to understanding motivation, boss-managers are looking for something that does not exist. But they keep looking because they, like almost everyone else, accept the external control theory. 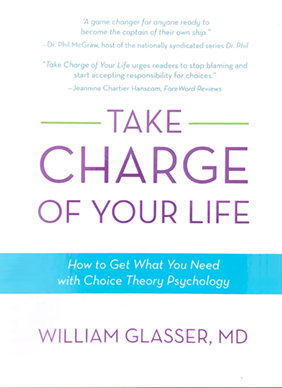 According to this theory, our behavior is almost always motivated by a stimulus that exists outside of ourselves.”— William Glasser, M.D. 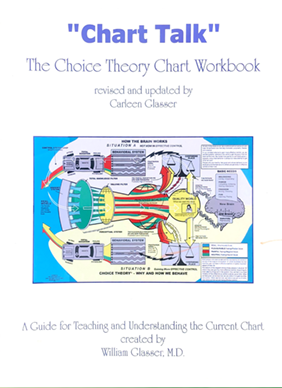 This is a guide for teaching and understanding the brain as a control system as diagramed in the chart entitled, “How the Brain Works” which is included in the booklet. 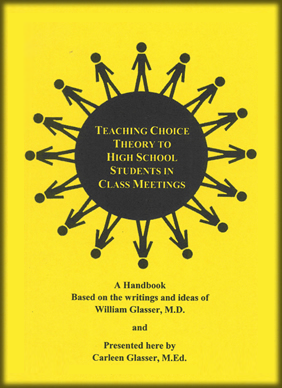 Information presented clearly details “why and how we behave“. 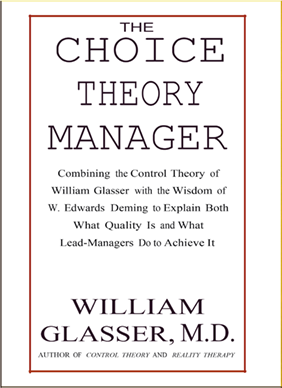 Emphasis is placed on how Choice Theory is used to counsel and/or manage people. 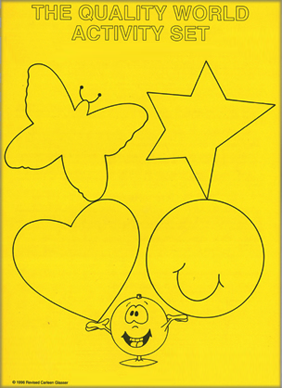 In order to show the difference between when we are Not Now in Effective Control and when we are Gaining More Effective Control, this section of the chart has been divided into two parts, Situation A at the top shown with the pink background) and Situation B at the bottom (shown with the yellow background). This is only done to show how exactly the same system works under two different conditions. Keep in mind that only one of these situations is happening at any given time. 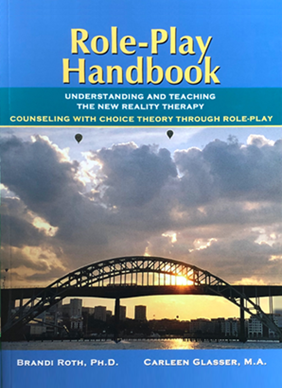 Although each of us is always attempting t move from Situation A to Situation B, it becomes the specific task of the counselor or coach to help people- be it friends, students, clients, or employees- make this move. 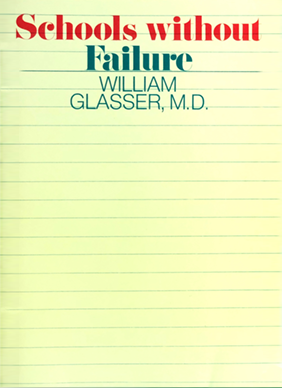 —William Glasser, M.D. 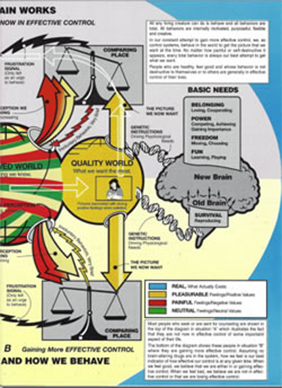 This provocative and innovative diagram of the brain as a control system clearly details “why and how we behave”. 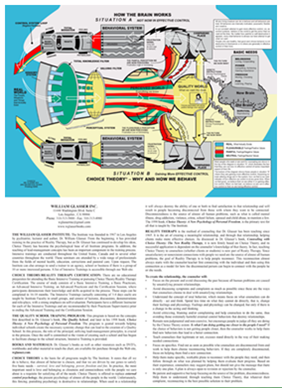 Dr. Glasser’s pre-medical training as an engineer is evident in this brilliant creation. 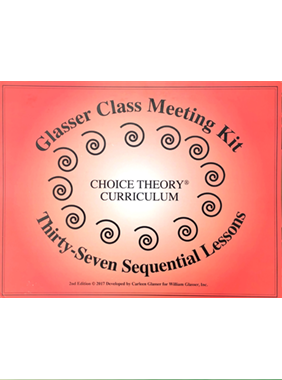 21-3/4″ x 34″ Full Color.